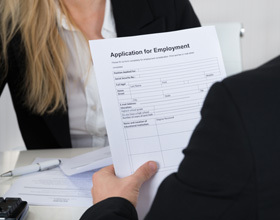 Most employers and businesses that have a vacancy will request that you send through a cover letter, resume and in some cases, respond to a Key Selection Criteria to apply. The goal of a cover letter is to get the employer to read your resume and deem you suitable for an interview. Every resume should have an accompanying cover letter. The cover letter acts as an introduction to your resume and tells the employer what position you are applying. Paragraph 1: Introduction and what position you are applying for. Paragraph 2: Your career summary (from your resume). Paragraph 3: Thank them and finish the letter on a positive note. Tailor the cover letter to the company address, or at least add the name of the person you are sending it too. Your resume (sometimes called your "CV") is an important tool when applying for a job as it is the first impression you will make. It doesn't matter how qualified you are, or how much experience you have - if your resume is poorly presented, badly written or has spelling/grammatical errors you're going to have trouble getting the job you want - or even an interview. A resume or curriculum vitae is a marketing tool, a way to sell yourself with one main purpose which is to win you an interview. You should always have a job in mind when writing your resume so that you can tailor the information in your resume to fit the job you are applying for. When looking at a job advertisement, take notice of the key words used, they are the ‘clues’ you can use to your advantage. Key words used in the ad are the important skills that the employer is looking for. Sounds pretty simple but don’t underestimate this section of your resume. Many get it wrong! You may have changed address, or emails or even mobile phone numbers so always remember to update it each time you apply for a job. Make sure that if you include an email that is professional. This is arguably the most important part of your resume, it is where the employer answers the question: ‘could this person be right for the job’? Sell yourself here and make sure you use the key words from the ad. Education is anything that you have done that has given you a new skill or qualified you for something. It should be a simple listing that includes where, when and what. Don’t forget to include short courses and workshops (i.e. RSA, first aid, food handling). The employment history is where you list all the times you have been employed or worked for someone. This can also include volunteer/unpaid work and work experience. Start at most recent and work back. Include the position name, employer name and dates as well as what your key responsibilities/achievements were. Remember to link this back to the key words in the job ad. A reference or referee is someone who can vouch for you such as a previous employer, teacher or coach for example. An employer will ring your referee before they employ you to check that you are reliable and have the skills you say you have in your resume. You must always ask a referee for permission to put them on your resume and make sure they know what the role is that you will be applying for. This will help them to be prepared when they get a call to talk about the skills you have in relation to that role. EVERY employer will google you on the internet or search for you on Facebook. Every time you post something on social media, imagine your future employer can see it. Ensure your privacy settings are updated. That goes for facebook, twitter, instagram, even snapchat in some cases. Include the Key Selection Criteria on a separate word document, ensure it has a title and reference to the job title and reference number. Also include your name and the page number, so the employer can keep your documents together. Answer/respond to each criteria with an example of what you have done in your past job roles. The STAR method, Situation, Task, Action, Result, provides you with a structured way to respond to key selection criteria as well as provide you with a method to answer a question asked in a behavioural based interview. Describe the situation/environment you were in. What did you need to accomplish to deal with the situation? What was your role concerning the problem, issue or assignment? What did you do? Set out the steps you took to resolve the situation. What was the outcome? What did you accomplish? What did you learn? Promote yourself and your achievements.